In comparison to my last entry, life has quietened down no end. Got my car through its MOT eventually (even though Ford ended up kidnapping it for 2 days because they'd failed to order the parts needed for the re-test). Work has been kind of slow over the past couple of weeks too, so I've taken the opportunity to slope off early and head down to the garage to tackle the rest of the donor bits. First on the agenda was the front hubs - or stub axle carriers to give them their proper title. 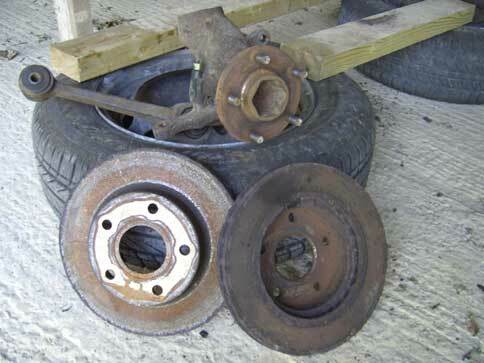 To start with I needed to remove the front discs which turned out to be well stuck to the hub. 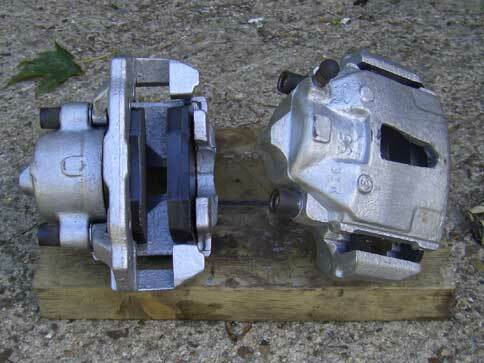 The Haynes manual helpfully tells you to "remove the spring clip holding the disc to the hub then remove the disc". This translated to "check for spring clip holding the disc to the hub, discover it's missing, scratch head over what is holding it together and proceed to smack repeatedly with a hammer until it gives up its grip..."
More wire brushing, elbow grease and brown dust and the hubs have come up pretty well. The bearings appear to be in good condition so I didn't bother taking them apart, just replaced the dust caps on the back as the original seals disintegrated when I took them off. A quick coat of hammerite and they're looking very presentable too (see pictures). Next job was the rear calipers and the news was not good. 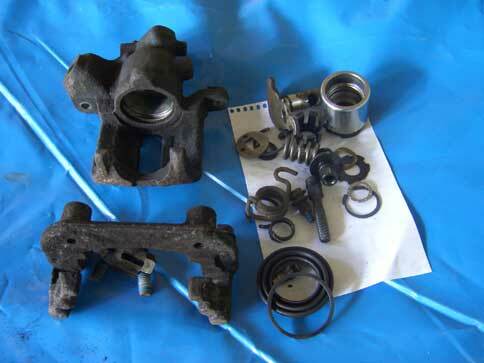 Although the internals of the hydraulic parts were fine, the piston faces were quite badly corroded and the handbrake mechanisms were not in a good way either. One was full of rusty goo and well seized, the other was ok, but the seals have gone and need replacing. I phoned Ford to see what they could do for me and they faxed me their parts diagram that shows the bits they can supply. According to their diagram (and the guy behind the parts desk) I can't buy individual pieces, Ford bundle bits together and sell them that way. For example - to get the seals I want I need to spend £46 + VAT per side to buy a "caliper repair kit" which also comes with a new piston, adjuster nut, washers, etc etc. 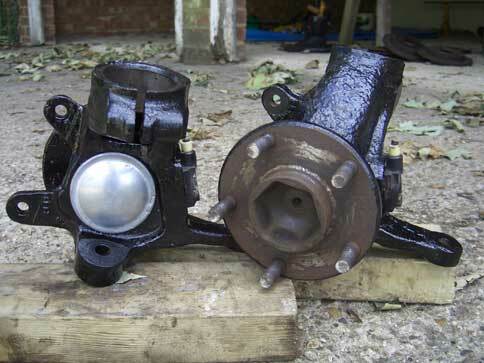 A phone call to Camberley Auto Factors revealed I could get a completely reconditioned caliper for just a few pounds more. It was suggested on the Cobra Club forum that even Halfords could manage a "seals only" kit for around £10, but I haven't had time to investigate that option yet. I think I will probably bite the bullet/credit card and exchange the units I have. Slightly disheartened by this unexpected turn of expense I started to attack the rear suspension arms and driveshafts. After liberally dowsing the driveshaft bolts in a mix of WD40 and degreasing agent I tried to undo them. They were so stiff I managed to completely bugger the new socket bit I bought for the purpose - grrr!! Still, despite giving its life for the task it did hold out long enough to get one driveshaft off. Fortunately, the CV joints are well greased and look to be in good condition, so I popped a latex glove over them to protect them and put the driveshaft to one side. I'm a big fan of the last one at the moment. I'm going to need an angle grinder anyway to cut the old damper bracket off and power tools are always good for venting a bit of frustration, so looks like I will be making a trip to the shops again this week. Still haven't got a delivery date for the chassis yet, will try phoning Pilgrim again tomorrow. How many parts does it take to make a caliper? ?